Welcome to the website of the Permanent Mission of the Republic of Uzbekistan to the United Nations Office and other International Organisations in Geneva. The site has been designed to provide information about Uzbekistan and main aspects of its cooperation with the international organizations in Geneva. We sincerely believe that it will help you to enhance your knowledge about Uzbekistan, better understand current socio-economic developments and political processes as well as multilateral activities of our country by providing you with varied and useful information. 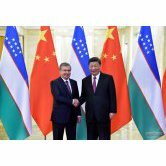 25.04.2019 | The major events of the visit by President of the Republic of Uzbekistan Shavkat Mirziyoyev to China began on the morning of April 25 with a meeting with the PRC President Xi Jinping. 25.04.2019 | Today, on April 25, in the residence assigned to him in Beijing, President of the Republic of Uzbekistan Shavkat Mirziyoyev met with President of the Republic of Belarus Alexander Lukashenko. 25.04.2019 | President Shavkat Mirziyoyev visited on April 25 the Huawei Research and Innovation Center as part of his participation in the Belt and Road forum. 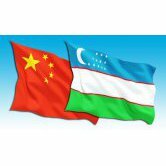 25.04.2019 | The President of the Republic of Uzbekistan Shavkat Mirziyoyev has arrived in Beijing on a working visit.